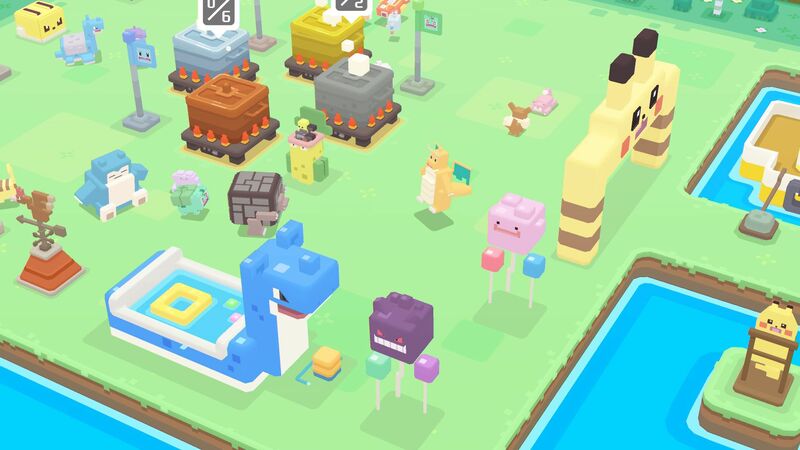 Nintendo’s Pokémon Quest is winning the heart of gamers everywhere, featuring charming, blocky iterations of Pokémon Red and Blue’s favorites in an equally blocky new world, Tumblecube Island. In Pokémon Quest, you’ll take a party of three Pokémon on challenging Expeditions, where they’ll battle wild Pokémon and collect valuable cooking ingredients. Use these ingredients to create enticing new recipes to lure even more Pokémon to your base. We’re sure you’ll want to catch ‘em all, so it’s important to keep those pots cooking. Of course, if you want to keep cooking and luring new Pokémon to your base, you’re going to need ingredients. Lots and lots of ingredients. Thankfully, Pokémon Quest features powerful, decorative items with bonuses that can increase ingredient drop rates, boost your Pokémons’ experience gain, and even increase the amount of PM Tickets you can collect each day! Decorations will have a substantial effect your game experience, so here’s everything you need to know about them. What are decorations and how do you get them? Decorations are exactly what they sound like: decorative items that can be placed in your base. These items feature the same whimsical design as found in the mainline Pokémon games—basically Pokémon-themed versions of everyday items. The assortment includes pillows and balloons shaped like Pokémon, yard decor including a pool and garden, monumental carved Pokémon statues, and more. There’s even an entire couch shaped like a Snorlax. That’s even better than the Snorlax beanbag chair, don’t you think? These decorations can be placed in your Pokémon camp by tapping the “Decorations” button on the left side of the screen. Your ability to place decorations wherever you please is slightly limited; each decoration size has a number of corresponding placement spots. You’ll gradually unlock some decorations as you progress through the story, which will offer experience gain bonuses to Pokémon under certain levels. You can also purchase decorations in the Poké Mart by spending PM Tickets. 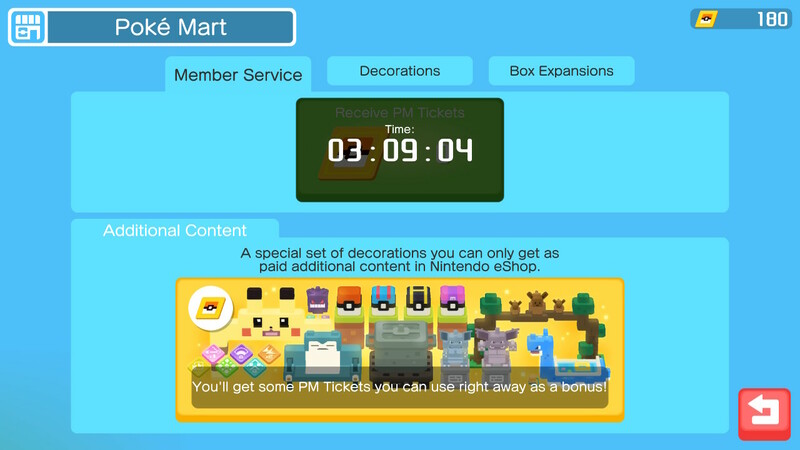 You can collect 50 PM Tickets every 22 hours by tapping the Poké Mart icon and selecting “Receive PM Tickets.” There are decorations that increase the amount of free PM Tickets you can collect daily, but these must be purchased from the Nintendo eShop using real money. You’ll also earn PM Tickets by completing Quests and Challenges, though each can only be completed once. As mentioned above, there are certain decorations which are only available as real money purchases in the Nintendo eShop. 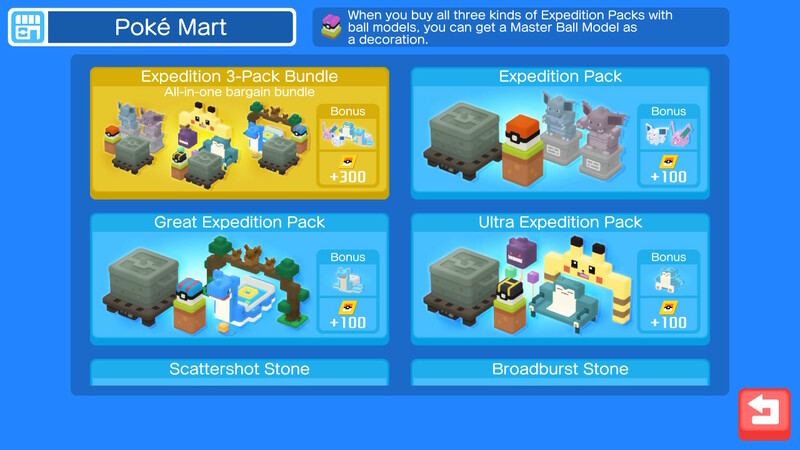 While they can’t really be considered pay-to-win items, as Pokémon Quest is a single-player game, they do offer substantial benefits over the decorations that are available by spending PM Tickets the Poké Mart. There are slightly less powerful versions of each decoration available for in-game purchase with PM Tickets, so you can eventually purchase all of these decorations in the Poké Mart with PM Tickets. From a purely aesthetic perspective, the eShop decorations feature exclusive designs, so you may find yourself lured by the idea of having a pool shaped like a Lapras—nothing else comes even close! 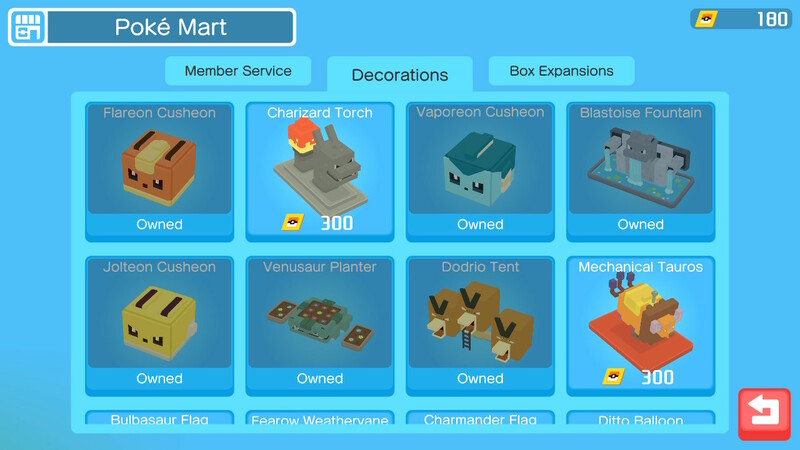 That being said, since the effects of all decorations stack, those included in the eShop bundles are definitely worth owning, if you don’t mind spending the cash and see yourself playing Pokémon Quest in the long term. You will benefit from all effects of decorations even if the decorations are not placed in your base, so you don’t have to worry about owning too many. You don’t have to place any decorations at all, if you prefer to keep things simple with just Pokémon and Cooking pots. Here’s a complete list of all of the decorations that are purchasable using the in-game currency, PM Tickets, along with the bonuses they provide. Remember that a decoration does not need to be placed in your camp in order to gain the benefit. Flareon Cusheon: Size of red ingredient drops x 1.5. Costs 50 PM Tickets. Charizard Torch: Size of red ingredient drops x 2. Costs 300 PM Tickets. Jolteon Cusheon: Size of yellow ingredient drops x 1.5. Costs 50 PM Tickets. Venusaur Planter: Size of yellow ingredient drops x 2. Costs 300 PM Tickets. Dodrio Tent: Size of gray ingredient drops x 1.5. Costs 50 PM Tickets. Mechanical Tauros: Size of gray ingredient drops x 2. Costs 300 PM Tickets. Bulbasaur Flag: Exp. received from Level-Up Training x 1.5. Costs 150 PM Tickets. Fearow Weathervane: Exp. received from Level-Up Training x 2. Costs 500 PM Tickets. Charmander Flag: Success rate of Move-Learning Training x 1.5. Costs 200 PM Tickets. Ditto Balloon: Success rate of Move-Learning Training x 2. Costs 700 PM Tickets. Squirtle Flag: Number of ingredients received from recycling x 1.5. Costs 100 PM Tickets. Meowth Balloon: Number of ingredients received from recycling x 2. Costs 400 PM Tickets. These decorations increase the likelihood of attracting a Pokémon with a multi-socket, one which can be equipped with your choice of either a HP or ATK Power Stone. Victreebel Golf Bag: Chance for a Pokémon with a multi-socket x 1.5. Costs 200 PM Tickets. Kangaskhan Swing Chair: Chance for a Pokémon with a multi-socket x 2. Costs 800 PM Tickets. This decoration increases the likelihood of attracting more than one Pokémon with a recipe. Pikachu Surfboard: Chance of attracting multiple Pokémon with your cooking x 1.5. Costs 400 PM Tickets. This decoration increases your maximum number of battery charges. You can extend your battery bar an additional two more times by purchasing eShop decorations, for a total of eight energy. Mewtwo Arch: Maximum battery charges +1. Costs 700 PM Tickets. 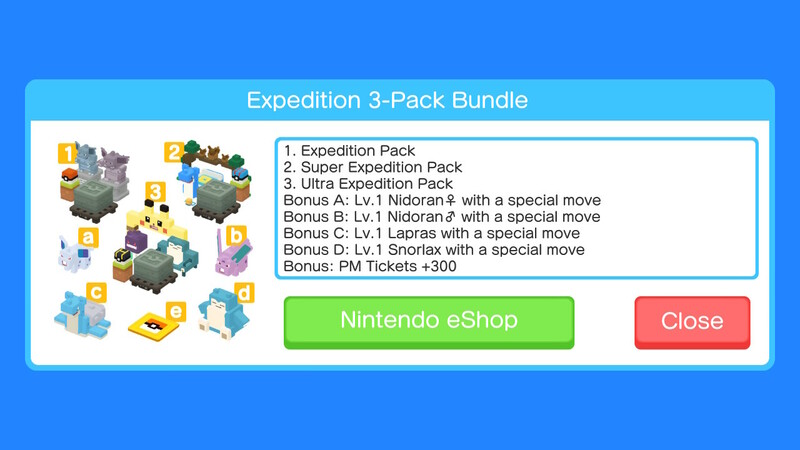 There are four different bundles available in the eShop: three offering a specific assortment of decorations and additional items, including actual Pokémon, and one which includes the content of all three bundles at a slight discount ($29.99 USD / £26.99 GBP). It’s important to note that the eShop bundles are the only way to further increase your maximum battery capacity (beyond six, courtesy of the Mewtwo Arch), as well as the amount of “free” PM Tickets you can collect each day. Lv. 1 Nidoran♀ with the special move "Sing"
Lv. 1 Nidoran♂ with the special move "Work Up"
Lv. 1 Lapras with the special move "Aqua Ring"
Lv. 1 Snorlax with the special move "Play Rough"
Includes all three of the aforementioned bundles. It’s important to note that you can still purchase this bundle if you’ve purchased any of the lesser-priced bundles that are included within, so be sure to avoid making redundant purchases. There is also as set of statues that can be earned through regular progression in Pokémon Quest. You will receive one of these statues upon completion of each area, in the order listed below. It’s worth noting that subsequent statues will not stack the bonuses as with other decorations, but instead simply raise the maximum level cap of the Pokémon which will receive the 1.5x bonus. Prolific Statue: Exp. from expeditions for Pokémon up to Lv. 5 x 1.5. Spring Showers Statue: Exp. from expeditions for Pokémon up to Lv. 10 x 1.5. Flourishing Statue: Exp. from expeditions for Pokémon up to Lv. 15 x 1.5. Tranquility Statue: Exp. from expeditions for Pokémon up to Lv. 20 x 1.5. Gentle Breeze Statue: Exp. from expeditions for Pokémon up to Lv. 25 x 1.5. Abundance Statue: Exp. from expeditions for Pokémon up to Lv. 30 x 1.5. Purification Statue: Exp. from expeditions for Pokémon up to Lv. 35 x 1.5. Burning Mane Statue: Exp. from expeditions for Pokémon up to Lv. 40 x 1.5. Longevity Statue: Exp. from expeditions for Pokémon up to Lv. 50 x 1.5. Reverent Statue: Exp. from expeditions for Pokémon up to Lv. 60 x 1.5.